Our life would be unthinkable without the handy, maneuverable and versatile wheel loaders that are seen on building grounds and with regard to farming and forestry. 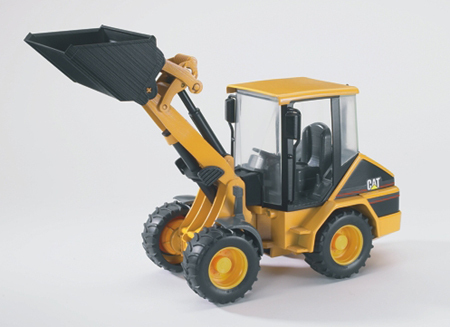 BRUDER is owner of a CAT license for high quality plastic toys scaled 1:16 and consequently our CAT range was enlarged by a new CAT wheel loader. 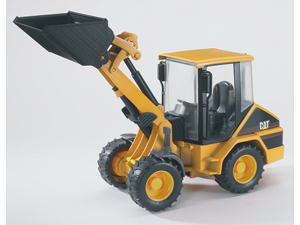 With this wheel loader the kids can imitate the reality. The BRUDER model is equipped with real working loading mast and shovel. The shovel can be tipped and detached. Accessories like the BRUDER box-type pallet, winch and forks for the front loader, all parts available in a set with item no. 02008, contribute to a very high degree of play value. The CAT wheel loader completes our very successful program of compact vehicles. With the launch of this wheel loader BRUDER proves that the production of high quality toys in Germany at a favorable price is possible and highly esteemed by the consumer. CATERPILLAR Wheel loader articulated steering boom that raises and lowers bucket scoops and dumps partly glazed driver's cabin sculptured tires rear coupling detachable.